Michael Albertyn was born in Kimberley on 28 November 1938. Otto Landsburg, an internationally acclaimed artist from Germany was Michael’s Grandfather. He has enjoyed tremendous success throughout his career as an artist, and lately as an international acclaimed artist. In 1995 he travelled extensively throughout the California wine district and the Hawaiian Islands to gather reference material for exhibitions of his paintings that year in the USA and later in Europe. He studied art under well-known artists like Victor Visser, W.H. Coetzer and later at the University of Stellenbosch. 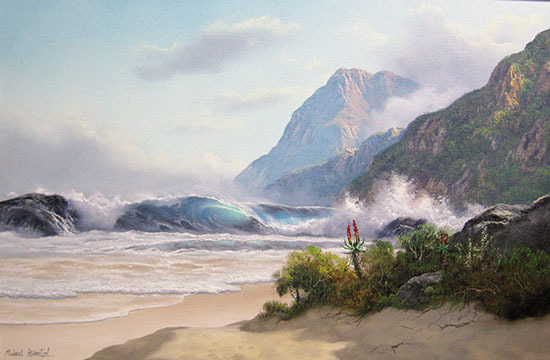 He is known for his realistic style and composition of the Cape winelands and Seascapes. He presently resides with his family in the Cape Province in South Africa.